Skydive Noosa - Famous For Fun! Tandem skydive with Skydive Noosa from up to 15000 feet, you’ll experience an insane 60 seconds of life-changing free fall. Float under canopy for 5 to 7 minutes over the spectacular Sunshine Coast’s surf beaches, Noosa and hinterland. Tandem skydiving is one of the best things to do in around Noosa – you’ll see stunning beaches and ocean views as you free fall from up to 15000 feet into one of Australia’s favourite tourism destinations. Securely attached to your experienced tandem instructor, you will be guided through your entire skydive. Your adventure will begin with a safety briefing followed by a scenic plane ride to height. As the excitement builds, your expert instructor will prepare you for the countdown and together you will make the ultimate jump from up to 15000 feet. After you experience freefall reaching speeds of up to 220 kilometres per hour for up to 60 seconds, your instructor will pull the chute and you will soar serenely like a bird for up to five minutes taking in the breathtaking views. If you are feeling brave, take control and steer the parachute! Land safely on the soft Coolum beach! Up to 15000 feet is the highest altitude you can skydive from in Australia (without using Oxygen). That's 75 seconds on pure body flight! It's the bomb! 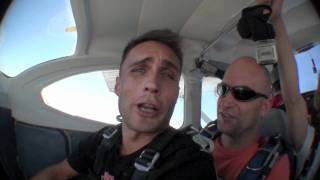 Tandem Skydive - for the thrillseekers! On the ground you'll be suited up in skydiving gear and your professional skydiving instructors will run through a few "dirt dives" - practice skydiving exits. You'll also be taught the skydiving basics of canopy control and safe landing procedures. Enjoy a flight up above the Sunshine Coast where, after a final check, it's time to hop out and take the quick way down - skydiving right onto the soft sand at Coolum Beach! Enjoy a 20 minute flight to jump height over the Sunshine Coast beaches, taking in the views of the hinterland, as far north as Noosa and Double Island Point, and as far south as Bribie and Moreton Islands. And then it’s time for a bird’s eye view! Jump out of the plane harnessed to your new best friend, one of Ramblers terrific instructors, and together enjoy nearly a minute of freefall. Your instructor opens the parachute at 5000 feet and the world stands still, the freefall is over, it’s quiet and the peaceful parachute flight begins. After five minutes under canopy you will land on the soft sand of Coolum Beach. Then it’s time to celebrate! The buzz of your skydive will last for days!